Sangam (lit. Confluence) is a 1964 Bollywood romance film, directed by Raj Kapoor, written by Inder Raj Anand, and produced by Kapoor with Mehboob Studio and Filmistan. The film stars Vyjayanthimala, Raj Kapoor and Rajendra Kumar in the lead roles, with Iftekhar, Raj Mehra, Nana Palsikar, Lalita Pawar, Achala Sachdev and Hari Shivdasani appearing in supporting roles inspired by hollywood movie Gone with the wind. Sangam was Raj Kapoor's first colour film, distinguished by its technicolor and epic length (even by Bollywood standards). It is also sometimes considered to be a magnum opus of Raj Kapoor, as one of his best works. It became a hit in India and is considered a classic today. One of the features of the film that became widely used later on in Bollywood is the use of foreign locales for on-location shooting, such as Venice, Paris, and Switzerland. This started the Bollywood trend of shooting songs sequences abroad (primarily in Switzerland), against the background of "exotic" landscapes. Overseas, the film released in the Soviet Union in 1964 and Turkey in 1968, as well as Bulgaria, Greece and Hungary. Director Dasari Narayana Rao remade the film in Telugu and Kannada languages as Swapna (1981). Sundar (Raj Kapoor), Gopal (Rajendra Kumar) and Radha (Vyjayantimala) have been friends since childhood. As they grow into adults, Sundar develops an obsessive romantic attraction to Radha, but she prefers Gopal, who is also in love with her. Yet, as Sundar has confided his feelings for Radha to him, Gopal decides to sacrifice his love for his friend's sake. Radha systematically resists Sundar's overtures but to no avail. For him, she is the only woman in the world. Matching Sundar's great love for Radha is his unswerving devotion to his friendship with Gopal. Eventually, Sundar enlists in the Indian Air Force and is assigned to a military mission in Kashmir. Before leaving, he extracts a promise from Gopal, whom he trusts implicitly, never to let any man come between Radha and himself while he is away. Subsequently, Sundar's aircraft is shot down over Kashmir. He is listed as MIA and presumed dead. This news saddens Radha and Gopal, but they are nonetheless now free to profess their love for one another. Among other expressions of love, Gopal writes her an unsigned prem Patra (love letter) which touches her particularly and which she hides away. Just when they begin taking steps to be married, Sundar returns, safe and sound. The self-effacing Gopal sacrifices himself once more, stepping back into the shadows, watching as the reborn Sundar resumes his wooing of Radha. Inevitably, the two marry. After the couple returns from an extended European honeymoon, Sundar is deliriously happy. His life's dream has been realised. Radha is resolved to be faithful to her husband and to put Gopal out of her mind. She privately asks him to stay away from her and Sundar because of the torture his presence causes her. Sundar's devotion to Gopal, however, is such that he constantly tries to draw him into their lives, much to Radha's chagrin. The perfection of their marital bliss is, however, shattered when Sundar accidentally discovers the unsigned love letter Gopal had written to Radha. Sundar is thunderstruck and assumes that Radha has been unfaithful to him. Producing a pistol, he demands she divulge the name of the supposed lover and threatens to kill the man, but she refuses. In the days that follow, Sundar becomes obsessed with discovering the identity of the letter's author and cannot return to normality. Radha's life becomes miserable, lived out against the incessant drama of Sundar's jealousy, threats, anger and fixation with the letter. Eventually unable to bear the wretchedness of her existence with Sundar any further, Radha flees to Gopal for help. Sundar takes the same route, unaware that Radha has gone to Gopal's house. There, matters come to a head. The overwrought Gopal admits his authorship of the infamous letter to Radha, an admission which almost destroys his friend. Gopal, perceiving no exit from the impasse at which the three have arrived, kills himself with Sundar's pistol. Radha and Sundar are finally reunited – in mourning. This love triangle is a psychologically multifaceted tale about male bonding, the meaning of love and friendship. In the context of these relationships, Sundar is the one who is preventing the other two people's happiness and finally also thwarts his own. He appears as being naive and innocent, yet he seems adamant at only noticing things that suit his mindset. He is full of self-pity and bullies the others emotionally. An important and critically regarded theme in the film is male bonding and the informal sharing of a woman between two male friends. Gopal indulges in his own "sacrifice", but never thinks of the woman's feelings he ostensibly loves. In the late 1940s, Raj Kapoor planned to launch a film under the title of Gharonda with Dilip Kumar, Nargis and himself in the lead playing the central characters. The story was penned by Inder Raj Anand during the making of Kapoor's first directional film, Aag (1948). However, the film was postponed for several reasons and was in development hell until 1962, when it was titled as Sangam, with new cast and crew. Initially, Dilip Kumar was approached by Kapoor to play the role of Gopal Verma. Kumar agreed to play either one of the two male roles with condition that he be given the right to edit the final copy of the film. Since Kapoor could not accept Kumar's condition, he then approached Dev Anand for the role. The latter also declined the role, citing call sheet problems as reason. Soon Rajendra Kumar was finalised for the role. Nargis was to appear in the film too, but her relationship with Raj Kapoor had just ended. Furthermore, she did not want to appear as Rajendra Kumar's lover having just played his mother in Mother India. Therefore, Vyjanthimala was cast in the female lead. The music for this film was composed by Shankar Jaikishan, while the songs were written by Shailendra and Hasrat Jaipuri. The soundtrack was listed by Planet Bollywood as number 8 on their list of 100 Greatest Bollywood Soundtracks. Vyjayantimala made her debut as a singer by beautifully humming to the tunes of Yeh Mera Prem Patra Padhkar, along with Mohammed Rafi . Sangam was a success at the box office. Boxofficeindia.com reported the film had collected ₹80,000,000 and its net collection, ₹40,000,000. Similarly, Boxofficeindia.co.in reported the film had the same box office collection, while its adjusted to inflation by comparing the collection with the price of Gold in 1964 is about ₹7,173,154,362 (US$100 million). On the contrary to the both reports, Ibosnetwork.com claim that Sangam grossed around ₹50,000,000 with its adjusted to inflation gross to be ₹7,602,400,000 (US$110 million). By the end of its overall box office collection, Sangam was labelled as blockbuster at the box office, where it was the highest-grossing film of the year. 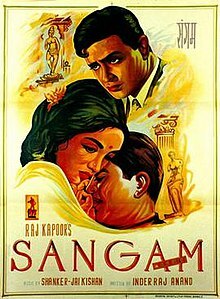 Furthermore, Sangam also ranked as second highest-grossing film of the decade by Boxofficeindia.com behind Mughal-e-Azam, where its adjusted to inflation net reportedly was about ₹885,700,000 (US$12 million). The film was also ranked at fourth by Boxofficeindia.co.in in their list of "Top 50 Film of Last 50 Years", which feature all-time highest grossing Bollywood films by using the relative price of gold in different years to arrive at a hypothetical current value of box office collections of past films. Best Lyricist Shailendra For "Dost Dost Na Raha"
Due to its runtime of three hours and fifty-eight minutes, Sangam became the first Indian film to be screened with two intervals in theatres. Both Raj Kapoor and Rajendra Kumar were friends in real life; their children got engaged, but they broke up and Kumar's son married Sunil Dutt's daughter. Vyajanthimala reinvented herself in this film playing a modern Indian girl while appearing in revealing costumes and swimsuit. The Israeli film Desperado Square revolves around the revival of a long disused cinema, with a showing of Sangam. The plot of Desperado Square both parallels and serves as a tribute to Sangam. Sangam may have inspired the 2001 Hollywood film Pearl Harbor, which has a strikingly similar story line, but with only one friend being a pilot in Sangam, whereas both are pilots in Pearl Harbor. The aircraft on which Gopal (Rajendra Kumar) returns from England is named Gouri Shankar, which was actually Air India Flight 403, which was a scheduled Air India passenger flight that crashed at Sahar International Airport in Bombay, India on 21 June 1982. Buddha Mil Gaya of the film. ^ Aḵẖtar, Jāvīd; Kabir, Nasreen Munni (2002). Talking Films: Conversations on Hindi Cinema with Javed Akhtar. Oxford University Press. p. 49. ISBN 978-0-19-566462-1. most of the writers working in this so-called Hindi cinema write in Urdu: Gulzar, or Rajinder Singh Bedi or Inder Raj Anand or Rahi Masoom Raza or Vahajat Mirza, who wrote dialogue for films like Mughal-e-Azam and Gunga Jumna and Mother India. So most dialogue-writers and most song-writers are from the Urdu discipline, even today. ^ Sergey Kudryavtsev. "Личное СВК (13000 названий) - фильмы 1961–1965 годов (часть 2 – 200 фильмов)". ^ a b c d e f g Surendra Miglani (28 May 2006). "Sangam revisited". The Tribune. Retrieved 29 April 2012. ^ "100 Greatest Bollywood Soundtracks Ever – Part 4". Planet Bollywood. Retrieved 16 February 2012. ^ a b "Box Office 1964". Boxofficeindia.com. Archived from the original on 12 February 2010. Retrieved 25 May 2012. ^ Nitin Tej Ahuja; Vajir Singh; Saurabh Sinha (1 November 2011). "Worth Their Weight in Gold!". Boxofficeindia.co.in. Archived from the original on 15 September 2017. Retrieved 25 May 2012. ^ "Sangam". Ibosnetwork.com. Retrieved 25 May 2012. ^ "Top Earners 1960–1969 (Figures in Ind Rs)". Boxofficeindia.com. Retrieved 25 May 2012. ^ Nitin Tej Ahuja; Vajir Singh; Saurabh Sinha (3 November 2011). "Top 50 Film of Last 50 Years". Boxofficeindia.co.in. Retrieved 25 May 2012. ^ "BFJA Awards (1965)". Gomolo.com. Retrieved 14 June 2013. ^ "The Nominations – 1964". Indiatimes. Archived from the original on 15 June 2013. Retrieved 14 June 2013. ^ "The Winners – 1964". Indiatimes. Archived from the original on 21 July 2012. Retrieved 14 June 2013. ^ rediff.com, Movies: Classics Revisited: Sangam. Rediff.com. Retrieved on 20 November 2015. ^ Save the tiger – Photos | 2014 NDTV-Aircel Save Our Tigers Campaign Photo Gallery. Tiger.ndtv.com. Retrieved on 20 November 2015. ^ "Desperado Square", Israeli Film Database, Israel Film Center. ^ film review, "Desperado Square", the Chicago Reader. ^ How Raj Kapoor coaxed Vyjayanthimala for SANGAM. glamsham.com (10 January 2015). Retrieved on 2015-11-20. This page was last edited on 17 April 2019, at 14:38 (UTC).